BATON ROUGE — Bob McGregor launched WYNK in 1962 and brought along his conservative values and love of country music. Baton Rouge’s first country music radio station was born. Today, more than 50 years later, everything has changed, but Baton Rougeans’ love of country music seems to be progressively stronger each year. Sam McQuire, the mastermind behind much of WYNK’s current success, says the goal of the station is not to be the No. 1 country station in Baton Rouge but to be the top-rated station in the entire market. “We want WYNK to be well-rounded and truly reflect the lifestyle of Baton Rouge and southeast Louisiana. We know there is competition out there, but that is out of our control. We want to reflect the mind set of our listeners. We want to be a lifetime experience that touches listeners. So we want to keep listening to what they tell us,” McQuire said. WYNK is owned today by Clear Channel, which has 1,200 radio stations across the United States. Market manager Michael Hudson went to his computer to demonstrate some of the advantages of being associated with Clear Channel. He showed an impressive variety of services for local advertisers and for stations themselves that few individual stations or station groups could hope to offer. WYNK offers a live line-up of mostly local talent from 5 a.m. to 12 midnight. Local personalities are in-tune with what’s going on in the community throughout the day. News is offered in the morning. The station interrupts regular programming when there is a “big event” and turns over news coverage to WJBO, the group’s news/talk station in Baton Rouge. McQuire said the music business has changed dramatically in recent years with the rise of two large conglomerates — Sony and Universal. That in turn has led to the rise of new competitors, such as Big Machine. Country music has also gone through tremendous change over the past 30 years, he said, with each decade having its own new stars and new formulas for success. There were surges of new stars in the 1980’s and later a move to Urban Cowboy. For awhile, country had lost its focus but now has returned to mainstream country, McQuire said. She has also been a leader in working with and promoting local country music radio stations. WYNK has a lineup that appears to be solid. In addition to Austin James and McQuire, who is on the air from 3 to 7 p.m weekdays, stalwarts are Big D and Bubba Morning Show from 5 to 9 a.m., Kristen Gates from 9 a.m. to 12 noon, and The Michael J Show from 7 p.m. to 12 midnight. The shows are live but segments can be pre-recorded, making on-air mistakes few and far between. Big D and Bubba are “good ole boys” with a large following in the Baton Rouge area and 15 years of success. Austin James said the comic duo are immensely popular but don’t take themselves too seriously and just “live their lives.” One of the beauties of being a radio star is that you can walk around your hometown and not be recognized. WYNK listeners are encouraged to give back to the community too. 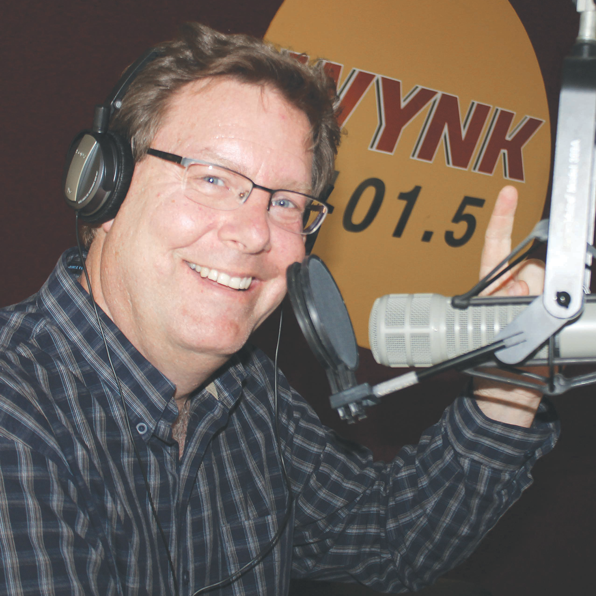 McQuire said WYNK listeners have raised more than $5 million for St. Jude. WYNKcountry.com is one of the Top 10 websites in the Clear Channel Group nationwide. Of course, WYNK is available on iHeart Radio, which brings in listeners from around the world. Clear Channel owns iHeart. “Even our competitors have to access listeners through our product, iHeart Radio,” Michael Hudson said. Hudson says radio is stronger today than it was in the 1980’s. James says the country music format is growing in Baton Rouge, and McQuire says the goal of WYNK is to be the No. 1 station in the market. If they are right, the future is indeed bright for WYNK. If Bob McGregor could only see her now!